I’m a flutist and teacher and just read your blog about the Xmas trios and thought I would ask your advice about repertoire for intermediate level HS students. 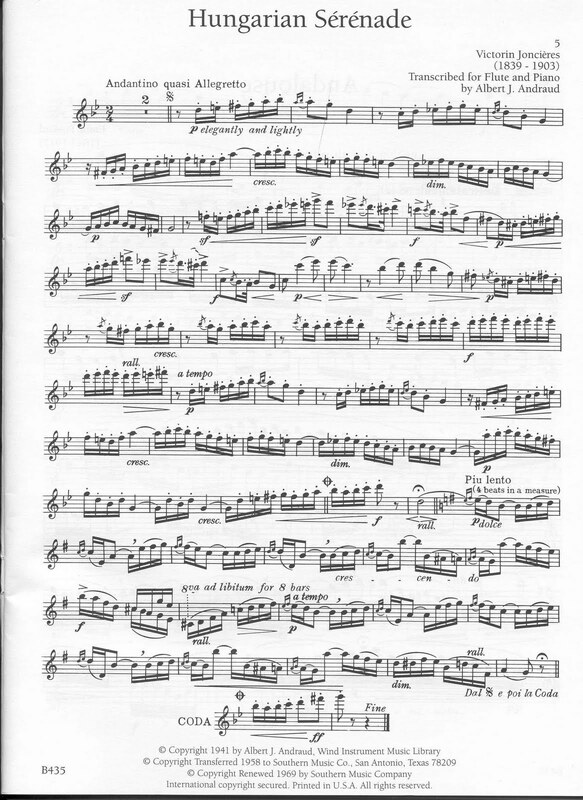 Specifically, I have a couple of students who have been excited by and excelled at playing the “Hungarian Serenade” by Joncieres (in the Cavally, 24 Short concert Pieces book). They would love to play more pieces like this one, but I’m having trouble finding anything appropriate. Their interest and abilities are admittedly somewhat limited of course. Do you have some ideas? I have found your website to be wonderful and fascinating. Thanks for the sample of the Joncieres. Yes Hungarian style Serenades and other "gypsy-esque" pieces are so popular with teens between 12 and 16. I wish there were more! 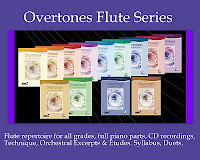 Fortunately, there is a great deal of a similar style of music in the new Overtones flute series of repertoire books. As I read through this set of eight repertoire books (with flute & piano full parts plus playalong CDs each book is only $18 to $24 each grade) I was struck by how many are in attractively exotic sounding minor keys, are nice and moody/emotional, have the kind of flash and flair and fast staccato sixteenth notes that highschool students typically love. So many students go through that "gypsy wanderer and flashy gypsy dance" stage, that I've always felt we should have more repertoire choices for them. Hear Tanzlied using the grade 4 repertoire video below from Overtones CD . For these short videos, below, I've chosen all the similar style selections from the Grade 4 Overtones book, made fade-out clips so you can hear for yourself. (with lovely photos randomly added from the cameras of my friends and I). I have chosen those flute pieces that are either in minor/moody modes, have fun and boppy sixteenth note passages, have a strong emotional appeal to teens, or have a folk music style themes. Donjon - Eight Salon Etudes - especially those like "Les Follets" which is terrific for this style of music and so very attractive to students. For unaccompanied flute solo or etude. Sarasate - Czardas for flute & piano (too violinistic and "wrong key" for students, at least for me, but again, the ending kind of rocks the house if you manage it.) Free Czardas pdf. Jacob Gade - Tango Fantasy - James Galway edition. Note: When viewing the free Andersen pdfs, scroll down to final few pages, as the flute part is below piano score in the above pdfs. If you want lots of this style at HIGHER grades to sift through, definitely look to Andersen library online. Andersen free sheetmusic library in Denmark. There are all opus numbers there in pdf. Berbiguier Eighteen Etudes - available in duet version with teacher's part by Altes. Mouquet - Bergeres from "La Flute de Pan"
Vivaldi - slow mvmts.from Piccolo Concerto in C, and other flute works. Your students might also enjoy some playalong or "Music Minus One" sets for working on their own during holidays on music from other "gypsy" styles like Tangos & South American Choros by Celso Machado (very good!). Also: Piazzolla Histoire du Tango and other Latin Classics for Flute (with playalong CD): MMO 3364 Note: The Sarasate pieces, and Granados are the easiest. The Piazzolla "Cafe 1930" movement is also playable at this level. The Music Minus One books only come with the solo part and CD, so are not for use in concerts unless the accompanist buys the guitar MMO book. However there are MMO online sound samples of each of the pieces at the above links, which can be fun to preview new pieces the student might use for fun. Also, here's a list for other likely favourite solos for flute of similar attractiveness. For Duets in this style, of course, naturally, you'll be checking the Doppler duet repertoire once the students get to grade 9 level. Doppler Hungarian Phantasy for Flute Duo op. 35 - played by two outstanding HS flutists into a mic in a gym, and they play without moving at all! Send your students to see this one! Duets in theme-variation style by Cambini-Bellini and others are free online also. The Overtone flute repertoire books are NEW this year, by the way! 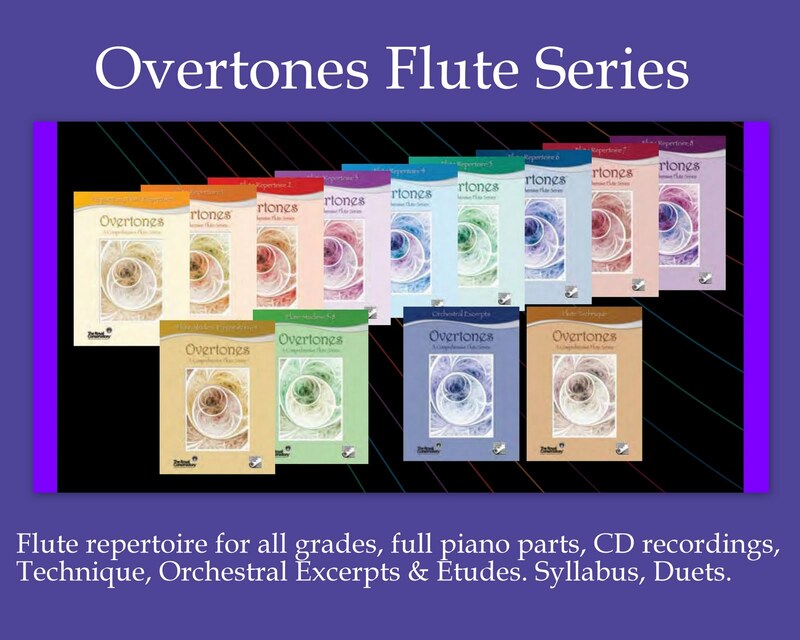 *NEW Overtones series for flute - my previous Overtones blog post. Hope this helps, and other teachers, do add your fave choices below using the comment button.